Brad Williams, age 42, grew up on a cotton farm and as a child had always said he would never farm. However, during his senior year in college, he learned the art of identifying and differentiating all of cotton fiber’s quality intricacies, also known as classing cotton. Brad then realized that being involved with cotton was what he wanted to enjoy as a career. He applied for and accepted a position at Staplcotn to work as a cotton specialist – servicing members’ farm accounts in a designated region. Brad worked for Staplcotn in that capacity from 1992 – 1995. In 1996, he married Kerry Kelley and was offered a position by her father, Richard, to spearhead his cotton warehouse operation so that Richard could grow his ginning business. Like Brad, Richard also came from a farming family that dates back to Richard’s grandfather. In 1998, Michael Roane married Richard’s other daughter, Leslie, and expressed an interest in farming. At that time, Richard farmed 4,500 acres. Today, the three men, along with their three wives, operate a farm that includes 22,000 acres within a 5-county area, along with their gin and warehouse located approximately 30 miles north of Memphis, Tennessee, just east of the Mississippi River. Brad has a marketing and finance background, Michael has a degree in plant and soil science, and Richard has an engineering background. Each use their skills accordingly on the farm yet all work together in all aspects, operating equipment such as planters or cotton pickers, making critical planting decisions and more. 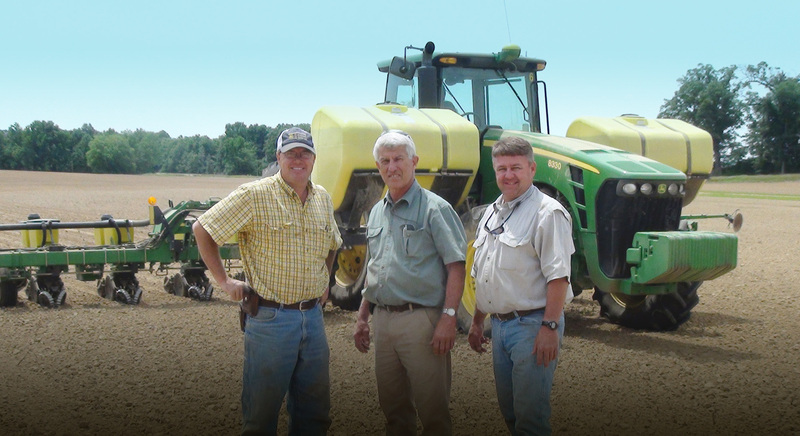 Brad, Richard and Michael are fortunate to have heavy clays in their land that hold a lot of moisture. On average, Western Tennessee receives around 50″ of rainfall annually. Most of their land is red clay, rolling hills that are cut into pieces by small tributaries to the Mississippi River creek bottoms. They practice dirt terracing and contour farming to conserve the moisture and to conserve and build the soils. “Be good to the land and it will be good to you,” remarked Richard. Their farming practices became that of “role model” for the area when they began contour farming. They had experienced a lot of erosion problems in the 70’s and brought the concept in to work on building their soils back. They also have increased organic matter in their ground.